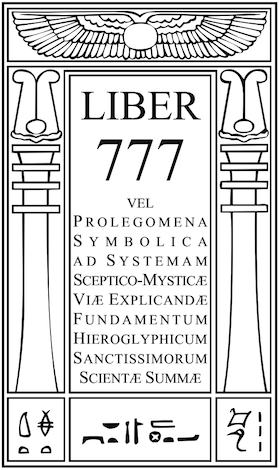 Since this Path joins, in the region of the Supernals, the Father to the Mother, we would logically anticipate correspondences expressing the attraction of the positive for the negative, and the love of the male for the female whereby the Yod and the Heh primal unite. Its astrological attribution is Venus, the Lady of Love. The pronunciation of this letter as Daleth means a "Door", which even in Freudian symbolism possesses the significance of the womb. The colours are Green and Emerald Green. The jewels are the Emerald and Turquoise; the flowers Myrtle and Rose; the birds being the Sparrow and Dove. The magical appurtenancies the Girdle, in view of the legend that whosoever wore Aphrodite's girdle became an object of universal love and desire. The title of this fourteenth Path is "The Luminous Intelligence", and its gods are Aphrodite, Lalita - the sexual aspect of Sakti, the wife of Shiva-and the sweet low-brewed Hathor, who is a cow-goddess. "The Aphrodite of Euripides' actual belief, if one may venture to dogmatize on such a subject, was almost certainly not what we should call a goddess, but rather a force of Nature, or a Spirit working in the world. To deny her existence you would have to say not merely: 'There is no such person ',.but ' there is no such thing'; and such a denial would be a defiance of obvious facts." The Goddess of Love in the Norse myths was Freyja, the daughter of Njord - a Jupiterian tutelary deity. 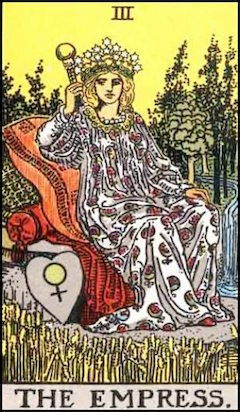 The Tarot card is IlI - The Empress, who bears in her right hand a sceptre, being a globe surmounting a cross, the astrological sigil of Venus. Her robe repeats this symbol, and at the side of her throne is a heart-shaped shield bearing also the sign of Venus. Facing her, is a field of corn, emphasizing the fact that she is a Goddess not only of Love but of Agriculture. She wears a green garland upon her head, and a necklace of pearls.